Buried by a pyroclastic flow of volcanic rocks in 79 AD, Pompeii provides one of our most detailed records of what life was like in the Roman Empire. Their lives would have been interrupted by a series of small tremors. It had to be worrisome; seventeen years earlier Pompeii had come close to being destroyed in a massive earthquake. The city was still being rebuilt. Possibly the residents woke on the morning of August 24, 79 AD and looked fearfully at the restless mountain that loomed over them… and then went on about their chores. Everything ended at 1:00 PM. Mt. Vesuvius exploded in a massive eruption sending tons of ash, gas and rocks spewing 20 miles into the sky and forming a dense mushroom cloud. Winds quickly carried the ash into Pompeii, turning day into night and dreams into nightmares. The majority fled, escaping by whatever means available. Those who stayed behind died… suffocating at first under the blanket of thick ash and ultimately, the next morning, being buried alive under a pyroclastic flow of molten rock and gas that flew down the mountain at speeds close to 100 miles per hour. Viewed from an archeological perspective, history’s tragedy has become today’s blessing. The molten rock and ash that covered Pompeii, also preserved it, providing historians with their most complete view of what life was like in ancient Rome. Over the next week, I will be blogging about our recent trip to Pompeii and sharing photographs of this remarkably preserved city. 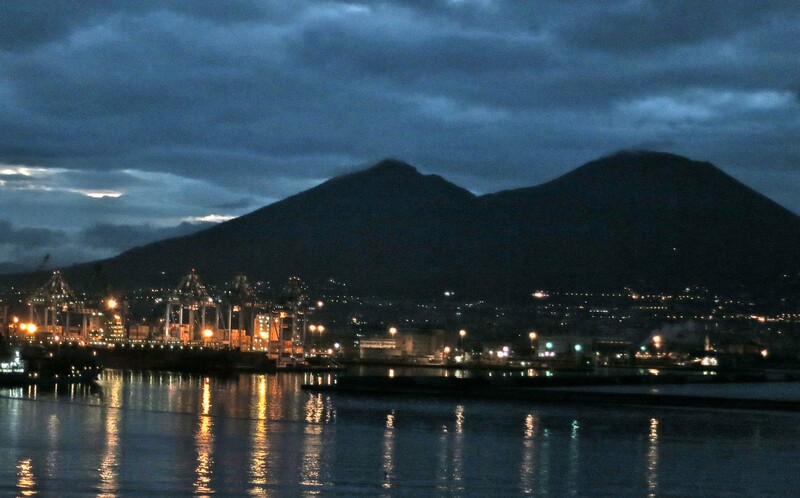 Our early morning arrival at the seaport of Naples showed Mt. Vesuvius looming over the city on a rainy day. While the majority of people living in Pompeii escaped, the remains of over 1000 have been found. By carefully pouring plaster into impressions left by the bodies buried under the pyroclastic flow, archeologists have created casts of these bodies. Several of these casts are on view in Pompeii. 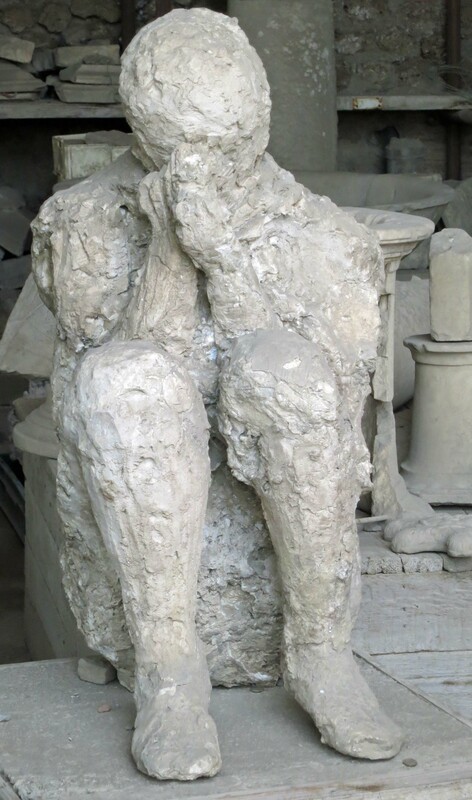 Plaster cast of body buried under pyroclastic flow of volcanic rock in Pompeii. 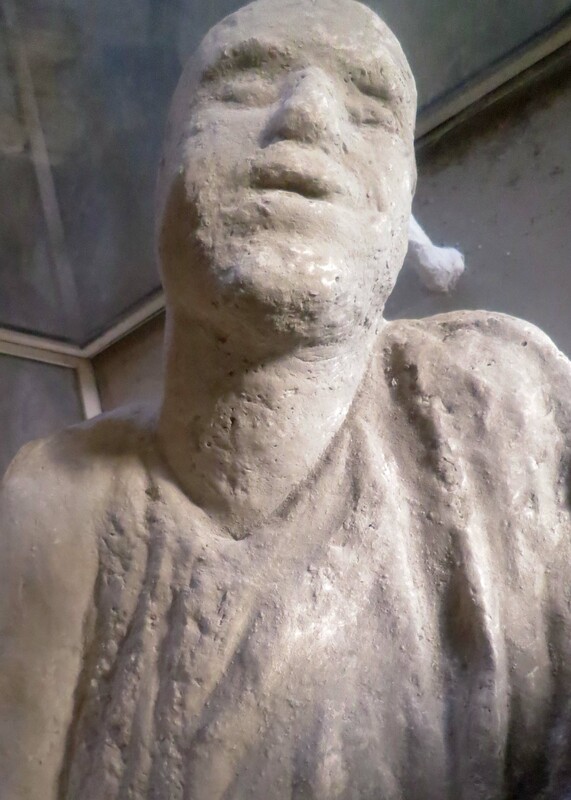 This plaster cast of a body found in Pompeii looks like the man merely went to sleep. This body cast from Pompeii suggests to me that the person was gasping for breath. 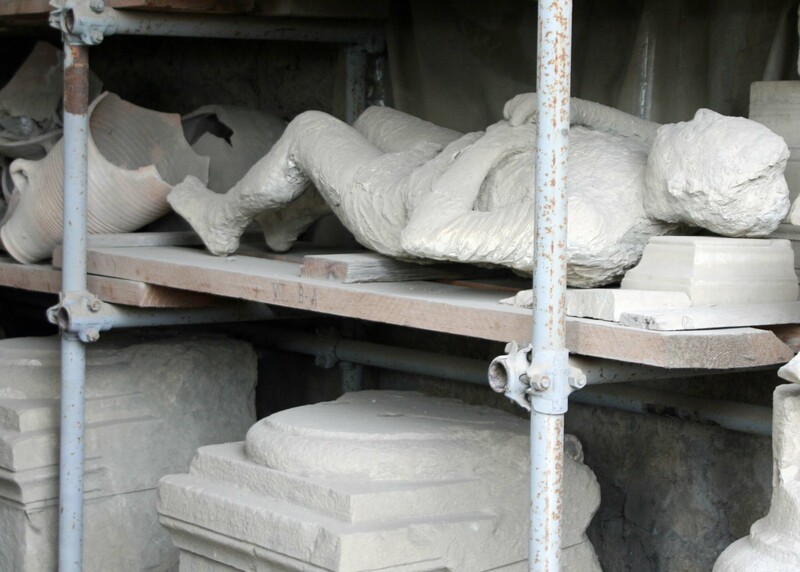 Several of the body casts in Pompeii were in storage. Today, a number of spectacular views of Mt. 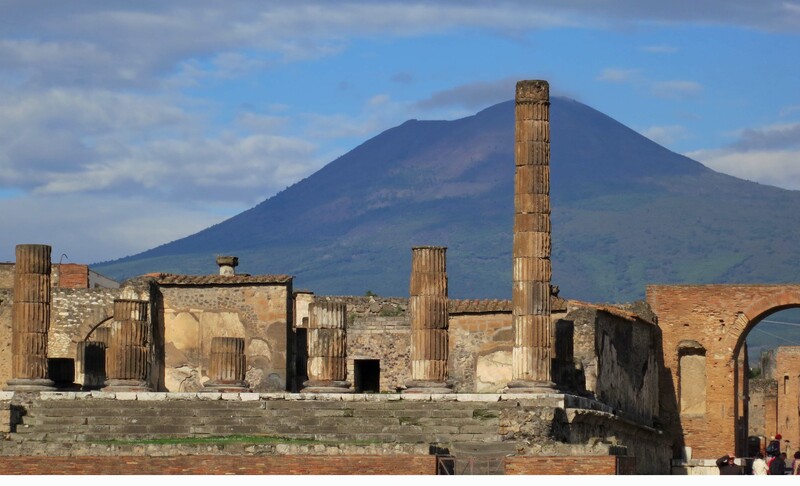 Vesuvius can be seen from Pompeii. The mountain is approximately four miles away. Mt. Vesuvius rises above the Temple of Jupiter in Pompeii. I can’t even begin ti imagine the fear and horror the residents felt on that fateful morning. Hard to outrun a 100 mph volcanic eruption.. It is amazing what the archaeologists have done in preserving those left behind.. amazing..
It’s truly amazing — to see these people’s last moments, as terrifying as they had to be amid such an event. Their expressions, their clothes, all perfectly preserved. I’ve never been, but I’ve always wanted to see the beautiful murals in person…. I am amazed at how peaceful some of the casts appear… like the person who just seemed to go to sleep. I read a book we have on this to my boy. He was disturbed. I did feel bad reading it, though I thought it was just so fascinating, and we’ve been studying Meditt geography. Will show him this post in a jiffy. I just can’t believe you’ve been there. PS I said “royalty” in the previous comment bc I’ve been pondering the advantages of blogging over putting out a book. Except for the small matter of TiMe for moms like me. Simply cannot do both at the same time. What a phenomenal post our friend! So much so, that we’ll be using it for my brother. We homeschool my brother & you did an incredible job with facts and the pictures are breathtaking. It’s hard to believe that they we’re able to capture these peoples’ last minutes immortalizing them forever!! Sharing this now my friend! 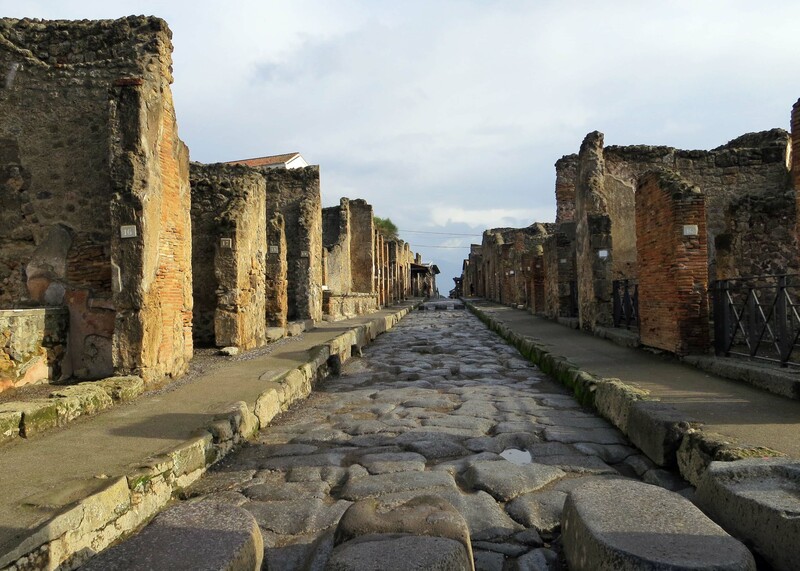 The ruts in that street, and the stepping stones tell a lot too … sadly I never made it to Pompeii. When there, do they drive you around like flocks of sheep or may you wander at will? I imagine it’s fenced off and they charge an arm, two legs and a foot for admission, with no time on for good behaviour~? Great blog about one of our favorite places. We were quite surprised, however, with the poured plaster bodies. Did not expect that when we first saw them. Although we were there for a full day, we really didn’t have long enough. You’ve done the place justice, though, with the great pics and copy. Thanks!